Personalized Emblem Plaque - - 10.25" x 8" address plaque with raised emblems tucked into the half-triangles at the top and bottom of this uniquely shaped cut-corner rectangle sign. Made in USA. The one-line sign holds up to five (5) 2" numbers. The two-line sign holds up to eleven (11) smaller characters on each line. Character count includes any spaces. Border trim and decorative emblems match the color of the characters. Four emblem styles: aster, florette (not shown), boquette, and orchard. 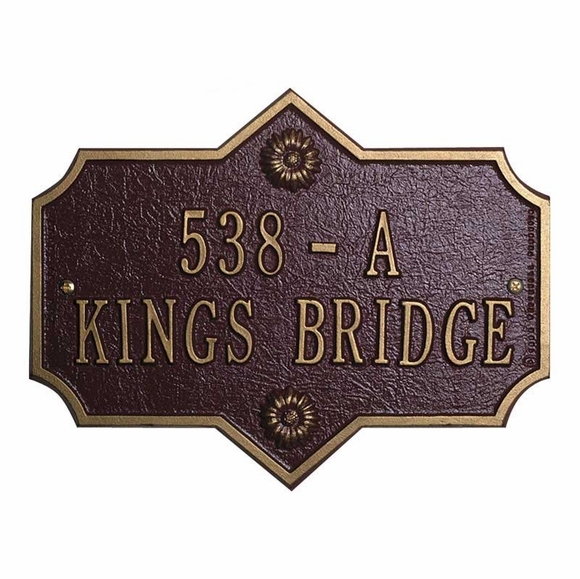 Personalized address sign defined by its unique shape and emblem accents. Made in USA.